when you spill them together like blood in the dirt? the light above the head? I’m free of this torture! American director Robert Adanto visits the UK while making his new film. 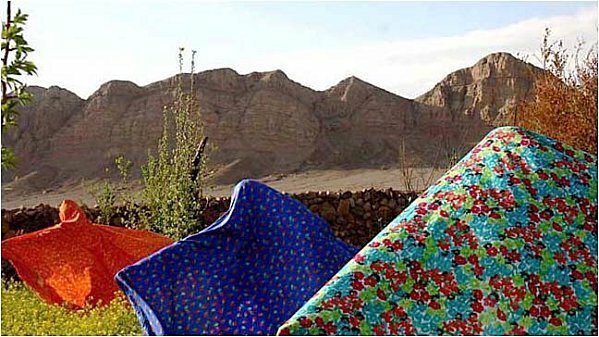 Pearls on the Ocean Floor is a documentary looking at Iranian women artists, born both before and after the revolution, inside and outside of Iran. The narrative is made up of images by the featured artists and other female Iranian artists, and the women speaking to the camera, which affords the film a certain honesty and directness. The film is screening at the School of Oriental and African Studies, Russell Square with a panel discussion on March 7th 2011, 7-9pm, all welcome. This entry was posted in highlights, Promos, Shows, Six Pillars to Persia and tagged afsoon, Art, documentary, haleh anvari, Iran, Iranian, Leila Pazooki, Malekeh Nayiny, pearls on the ocean floor, Persia, Pooneh Maghazehe, robert adanto, Sara Rahbar, Shadi Ghadirian, Shadi Yousefian, shirin neshat, Taravat Talepasand, women on March 6, 2011 by sixpillarstopersia.